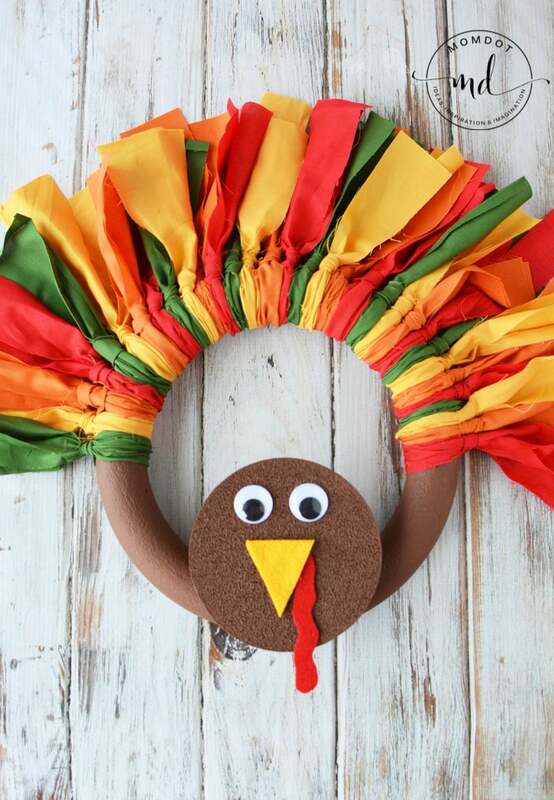 Turkey Wreath : How to make a Fabric Turkey Wreath with Slip Knots (not tulle) that is colorful and gorgeous for fall decorations. This step by step tutorial for a DIY Fall wreath is the perfect wreath for indoor holiday decorations or right on your front door! Even more fun than a tulle wreath, learn the tips and tricks of creating the perfect Tom the Turkey wreath that is delightful to make and to display. Looking for more easy to make Halloween decorations? You will love this super simple ” How to make a Halloween Wreath” instructional too! 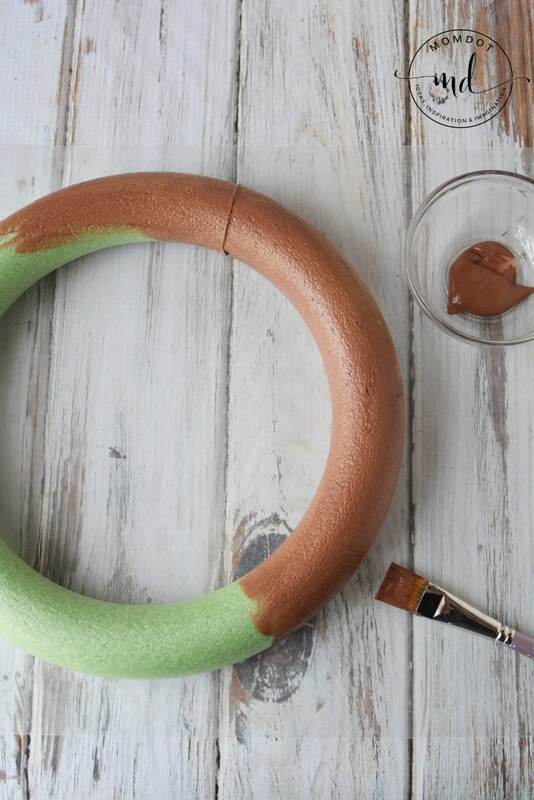 Use acrylic paint to paint the wreath form and floral disk. You’ll need 2 coats on the form, let dry between coats. When painting the floral disk, make sure you apply the paint heavily so it goes into the pores of the foam, showing less white foam. Lay 1 piece of fabric onto a flat surface and fold it half so it measures 18″ x 10.5″. Place a measuring tape across the folded area and use scissors to snip the fabric at 2″ intervals. Remove the tape measure and continue to trim the rest of the fabric so you have strips. Place your wreath form, face down on a flat surface. Fold a fabric strip in half and place the loop under the form. You’ll be making a slip knot. Bring the bottom, loose ends of the fabric through the loop, wrapping it around the form. Pull the ends firmly toward the outer edge of the form. This is the back side of the wreath. 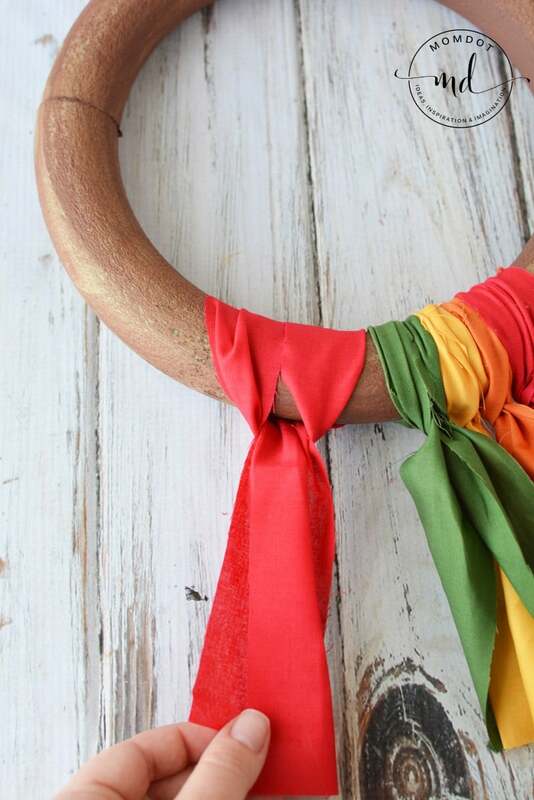 Continue to cover the wreath form with fabric, scrunching each piece together after it’s tied on. Repeat until you have the desired look of a turkey! About 2/3 of the wreath form will be covered. Flip the form over and you’ll have the front of the turkey feathers. Pull tautly onto the ends of the fabric to position to your liking. 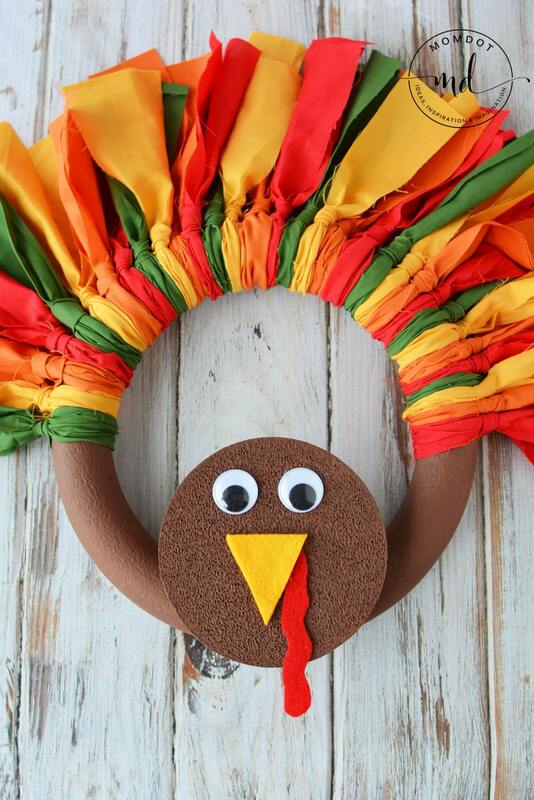 Use red felt to create a red turkey snood for the face, measuring about 3″ in length. Use yellow felt to cut out a triangle beak. I used 2 pieces of felt and glued them together to create more dimension. Glue the eyes, beak and snood onto the brown disk with hot glue. 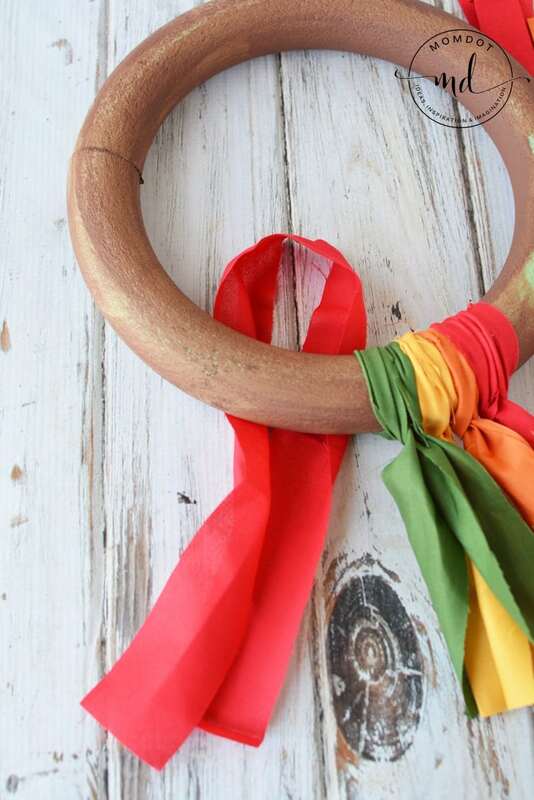 Attach the disk to the front of the wreath form with hot glue. NOTE: If you are not happy with the way the fabric hangs, you can lay the wreath on a flat surface, straightening out all of the fabric. Then generously spray with starch and let dry. Flip over and spray again on the back.